Shaarey Tzedek’s innovative addition to the 8:30 minyan has taken really off with a bang. 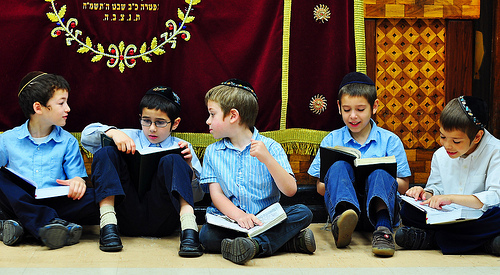 Under the direction of Rabbi Moshe Tropper, a new and unique approach has been implemented encouraging boys to participate in a Shabbos morning minyan. With a tiered point system that rewards the boys based on consistency, the program has quickly developed a loyal attendance of over 30 boys each week. Each Shabbos boys spend time with their friends and strengthen relationships as they enjoy some supervised indoor playtime. The program is centered around davening shachris, a Parsha learning league, and joining the 8:30 minyan at specific parts of the davening. As the boys mature they are encouraged to spend more time with their father in the minyan, and can increase the amount of points earned weekly by doing so. In addition, each week a number of boys are chosen to lead brachos or pesukei deaimra in the 8:30 minyan, as well as do galila on the sefer Torah. The morning ends with aspecial kids only table at the kiddush and a raffle. Immediately following davening many of the boys head over to the Emek Earl Childhood building for a 45 minute father/son learning. This partnership of Shaarey Tzedek and Emek offers our children an exciting and meaningful Shabbos experience.